Alpine Gardens LLC has grown from a small lawn mowing service for homes in Langhorne, Richboro and Huntingdon Valley to serving the lawn maintenance needs for communities throughout Bucks and Montgomery County Pennsylvania. Today we run 2 and 4 man crews of skilled landscapers to all kinds of jobs. Our lawn care teams work dawn to dusk six days a week. Each truck is fully equipped with wide commercial riding mowers, narrow 24” push mowers, and an array of trimming, edging, blowing and weed whacking equipment. We are also a landscaping company for commercial businesses in Northeast Philly, Lower Bucks and Central Bucks County. We also manage a team of professional landscapers with a trained eye for design, a grounds crew to help spread mulch, plant trees and move landscaping stones. Our dump trucks are working hard to deliver garden soil, top soil, triple ground mulch and landscape stones to our DIY landscapers. We move our small fleet of specialty equipment like hydraulic backhoes, front loaders and digging tools to job sights that require some heavy lifting. Your Landscape Management Team of Pattie Christensen and Scott Brittingham have been working together for over 15 years and have assembled a loyal group skilled professional landscapers that each bring a particular talent and expertise to your property. Rest assured we have the right equipment and lawn care experts for your project. EP Henry may be the local expert in hardscaping products but Alpine Gardens is your local installation expert of paving stones. Maybe you already had a flagstone patio installed but now find yourself needing to have the work redone or want a few driveway pavers repaired. 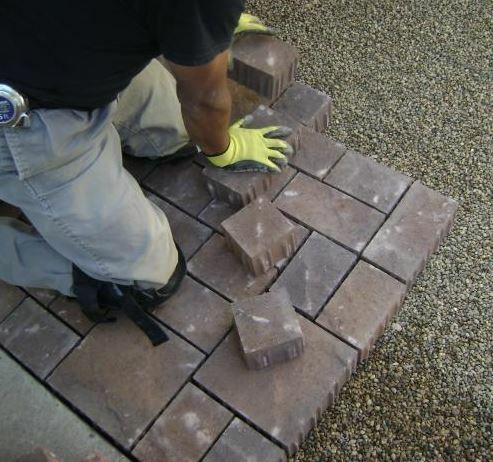 Broken or cracked brick pavers are often a result of weather, poor patio designs or a lack of structural support between your landscape stones. You can hire us to do the job right the first time or ask us to come in for a driveway, walkway or patio repair project. The experience we bring will be realized the moment we start the job.